Perhaps of interest to those who follow the history of our craft. After the beautiful old stones that were used to print the real lithography, offset printing relied upon a metal plate. The plate was made from a chemically coated aluminum plate exposed through a negative. The negative was made from a black and white paste-up of the page as it was to appear. Before the computer and all of the better photo typesetting, the fine old handset type was used to set the headlines and captions. These were then printed as reproduction proofs and pasted onto the page with text and graphics. The type then went back to the case. It received very little wear. It was a transition time and was a marriage of letterpress and offset printing. I have many cases of this type. Inky, Good Post! probably provoke a little Head Scratching and even some learning. (Author) Mid 70,s into late 80,s used that exact system, i.e. Repro-ing Monotype output for conversion for Litho use. Our Thompson (British Auto Platen) stood us in good stead, as the Repro Press. The Thompson did the job well. The Vickobold, The Victoria Art Platen, The Colts Armory, (All at parallel approach) would have been better, but as we say/said, *Needs must when the Devil is in the driving seat* & controlling the purse strings. - - Inky. Thanks. We still use repro pulls in our letterpress teaching studio. 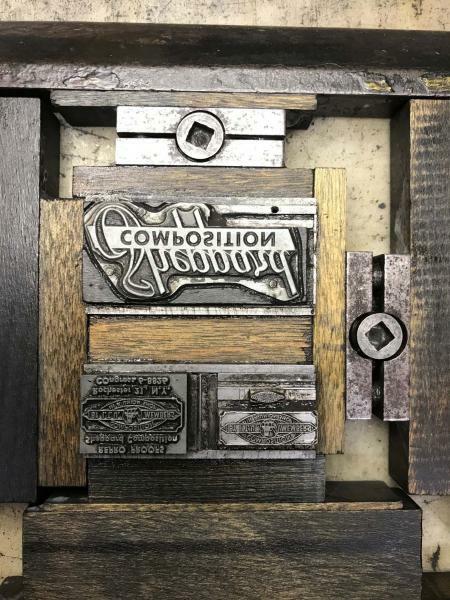 If the work requires more than a couple of dozen copies, particularly if more than a ‘kiss’ impression is needed, and if the type is old and/or rare, I insist they take a repro pull from the type, then print the job from plates made from the repros. This saves wear on the type, especially softer non-founders type. We owe it to future generations to look after old and often irreplaceable type, and taking repro pulls helps towards that end. Maybe a bit more history. Back in the late 1960’s I worked for a company in the UK producing paperback novels and they were printed on reel fed rotary presses using wrap around plastic plates. However If I have this right the USA had a trade restriction on the import of paperback books to protect the printers in the US. So before the newly set type (intertype) was sent to the foundry for plastic plates to be made, the pages of text (in type high chases) were repro’d on baryta paper ( a high white single sided matt coated paper of about 150 gsm) and we used an reconditioned American Miehle that could print a 40 x 50 inch sheet and it produced wonderful repro pulls that were sent to the US for litho printing. Years ago I worked as a college textbook designer at Harcourt Brace Jovanovich, in New York.Most of the books I worked on were sent out to photocomposition houses.But once I was given a mathematics text with many very complex multi-line equations. Photocomposition was impossible. Instead the text was sent to a Monotype house in the UK. I remember getting back the most beautiful, clean, clear proofs within a couple of days. I’m still not sure how they did it so well and so quickly. When I first started collecting handset type in San Francisco in the mid 70s, My first big “raids” were in professional Typography shops who had converted from metal to phototype. The fonts I acquired were always in pristine condition with no wear because they had always been used exclusively to pull repro proofs. A decade or so later I was also lucky enough to clean out a few more typographers in the Midwest. And yes, there was paper always exclusively used to pull repro proofs on. White coated on the front, and a light ‘powder blue’ on the back. Still have a large pile of it. Another flash from the past. My dad was an ITU typographer during the day and a job shop printer in the moonlight. 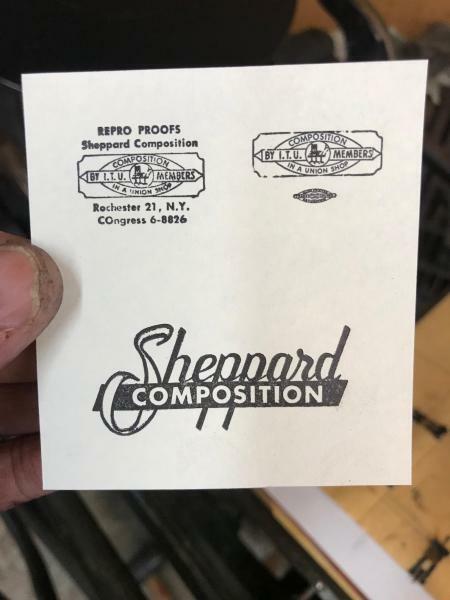 He operated a Ludlow at Sheppard Composition in Rochester, NY from the mid-1960s until the late 1980s. He was also an RIT grad. Here is a photo of two zinc dies and a pair of logo types that he saved. The top left cut would have been locked in a form with Linotype, Ludlow and/or the occasional hand composition, printed on high quality paper and provided to ad agencies and trade printers as a positive camera-ready image…until cold comp and later computers obsoleted the need for letterpress repro proofs. And one more shot from the past. When living in London in the early 1980s, I worked for several publishing houses. One of them was The Bodley Head. Our book jackets were all printed in offset, but the flap copy was set – following John Ryder’s instructions – in metal. Monotype Walbaum was used, and it was proofed on baryte paper before being pasted up on our artwork and sent off to the lithographers. Nice and sharp results!